Congratulations to Glenbeigh NS who won in the ‘Best Small School Category’ and to Ardfert NS who won the award for ‘Promotion of Gaelic Games and Culture’ at the Cumann na mBunscol awards ceremony in Kilkenny last Friday night. Mary Jo Curran teaches in Glenbeigh and Tomas Ó hAinifein in Ardfert, both great GAA stalwarts who would have been a great support to the pupils preparing for this competition. 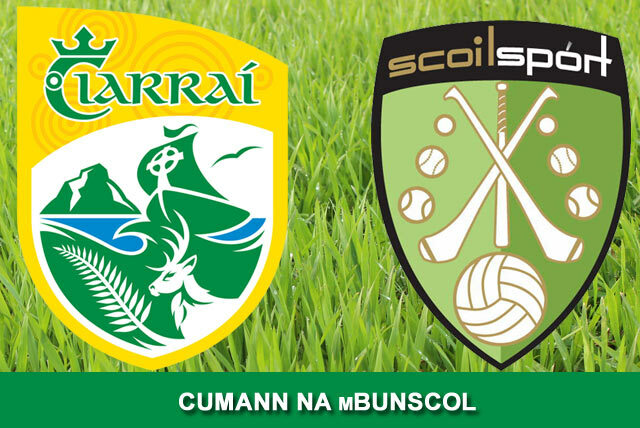 Kerry schools will be hoping to bring home some silverware from the Cornmarket Cumann na mBunscol Awards in Kilkenny on Friday night March 9th. Glenbeigh NS has been shortlisted in the Best Small School category along with Doon CBS from Limerick and Gaelscoil na bhFál, from the Falls Road in Belfast. Ardfert NS has been shortlisted for Promotion of Gaelic Games and Culture. Other schools shortlisted in this category are Darkley Primary School, Co. Armagh and The Downs NS, Co Westmeath. All will be revealed on Friday night in the Newpark Hotel in the Marble City. Kilkenny manager Brian Cody, a former primary school teacher himself, will be the guest speaker at the event.